This entry was posted on April 2, 2012 at 12:35 pm and is filed under Drama, Mystery with tags 2008. You can follow any responses to this entry through the RSS 2.0 feed. You can leave a response, or trackback from your own site. Indeed Andy. An acting masterclass. I absolutely love this movie; one of my favorites. The 4 main actors are among my favorite thespians, so imagine my delight. I love their work in Doubt so much. I still think Viola was robbed that year by Penélope (another one of my faves, but she didn’t deserve it for VCB). I have to agree Fernando. 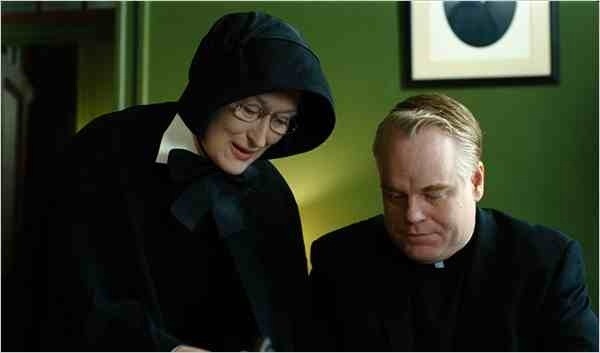 I was delighted to have Hoffman, Streep and Adams together also. Davis I’m a fan of but admittedly haven’t seen very much of her. I was impressed here though. The acting was completely superb all round. That’s what impressed me most. Wonderful stuff. I have only seen the beginning of this, but I need to watch it all after reading this. I really liked this film man. The performances are what stand out the most though. All three leads are superb and also a great turn from Viola Davis. Check it out Vinnie, I’d like to hear your thoughts on it. just checked out your review after remembering you reviewed it sometime ago. i just watched this myself and reviewed it. i gotta say it truly was a very good film and the doubtful tones in keeping with its ambiguity is rightly pointed out by you, which in turn makes it compelling. nice review too. I loved this film man. 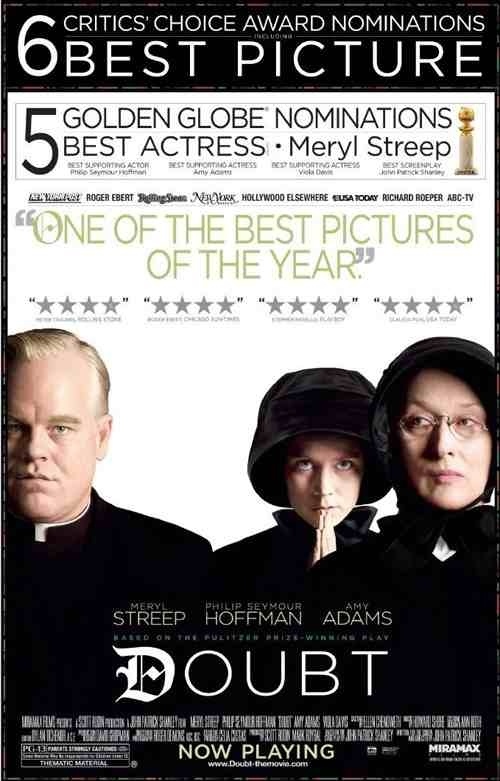 The acting was absolutely top class and “Doubt” is definitely the perfect title. It permeates the characters and the audience. Very cleverly delivered. I’ll swing by on your review a little later bud. Cheers man.